Lately there have been a lot of people; both Liberal and Conservative; who have called for the return of “literacy tests” to become eligible to Vote. This is in addition to the Conservative movement to roll back the Voting Rights Act of 1965. 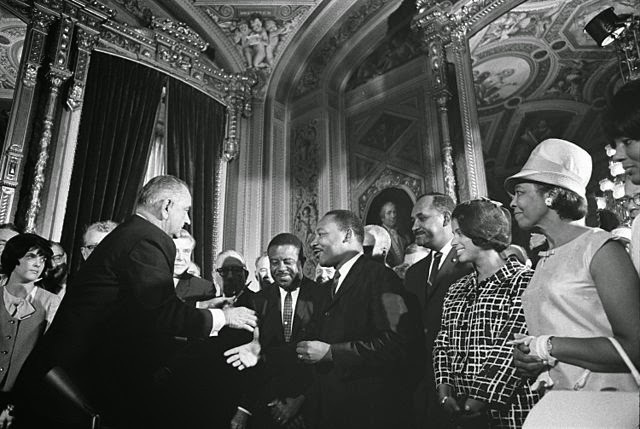 The photograph above was taken just after LBJ signed that bill into law in August 1965. Among the people in the photograph are MLK and Rosa Parks. Most people that call for the return of literacy tests are speaking in jest; more like exasperation at the views of the people who hold different political views than they themselves have. But, just for fun, I’d like everyone to take this 1965 Alabama test and see how they would score. Keep in mind that your level of education is far greater than that of the average African-American who would have been required to take this test in the 1960’s. And remember, in Alabama at the time education was a privilege and not a right for the people required to take this test. The next time you hear someone talk about how “there ought to be a test for voting” whip this out and see how they would fare. You have about 15 minutes to complete the test and one wrong answer is a failing grade. You will be surprised at how little you think you know. 1. Which of the following is a right guaranteed by the Bill of Rights? 2. The federal census of population is taken every five years. 6. Which definition applies to the word "amendment?" 7. A person appointed to the U.S. Supreme Court is appointed for a term of __________. 13. The Supreme Court is the chief lawmaking body of the state. 15. If a vacancy occurs in the U.S. Senate, the state must hold an election, but meanwhile the place may be filled by a temporary appointment made by ________________________________________________________________________. 16. A U.S. senator is elected for a term of _____ years. 17. Appropriation of money for the armed services can be only for a period limited to _____ years. 18. The chief executive and the administrative offices make up the ___________________ branch of government. 21. The Constitution protects an individual against punishments which are _______________ and _______________________. 22. When a jury has heard and rendered a verdict in a case, and the judgment on the verdict has become final, the defendant cannot again be brought to trial for the same cause. 24. Communism is the type of government in: _____U.S. 25. Cases tried before a court of law are two types, civil and _________________________. 26. By a majority vote of the members of Congress, the Congress can change provisions of the Constitution of the U.S.
27. For security, each state has a right to form a _________________________________. 30. Of the original 13 states, the one with the largest representation in the first Congress was ______________________________________________________________________. 32. Capital punishment is the giving of a death sentence. 34. "Involuntary servitude" is permitted in the U.S. upon conviction of a crime. 35. If a state is a party to a case, the Constitution provides that original jurisdiction shall be in ______________________________________________________________________. 36. Congress passes laws regulating cases which are included in those over which the U.S. Supreme Court has ____________________________________________ jurisdiction. 37. Which of the following is a right guaranteed by the Bill of Rights of the U.S. Constitution. 38. The Legislatures of the states decide how presidential electors may be chosen. 40. The Vice President presides over ____________________________________________. 41. The Constitution limits the size of the District of Columbia to ______________________________________________________________________. 42. The only laws which can be passed to apply to an area in a federal arsenal are those passed by ___________________________________________ provided consent for the purchase of the land is given by the _________________________________________. 43. In which document or writing is the "Bill of Rights" found? ______________________. 44. Of which branch of government is a Supreme Court justice a part? 51. The Congress decides in what manner states elect presidential electors. 53. Congress is composed of __________________________________________________. 54. All legislative powers granted in the U.S. Constitution may legally be used only by ______________________________________________________________________. 55. The population census is required to be made very _____ years. 56. Impeachments of U.S. officials are tried by ___________________________________. 60. Persons elected to cast a state's vote for U.S. President and Vice President are called presidential _________________________________________________________. 61. Name one power which is exclusively legislative and is mentioned in one of the parts of the U.S. Constitution above______________________________________________. 67. The power to declare war is vested in ________________________________________. 3. Habeas Corpus (immediate presentation of charges); lawyer; speedy trial. 52. (Preamble statements) "to form a more perfect union, establish justice, insure domestic tranquility, provide for the common defense, promote the general welfare, and secure the blessings of liberty to ourselves and our posterity."